How did you find yourself taking photos in a mall? In high school I took a lot of photos for both the newspaper and the yearbook, and in my first year of college I took pictures for the newspaper. When I was a sophomore I took my first color photo class and I had an amazing teacher. We talked very little about photography and more about the ideas behind it. I think the first assignment for the class was to watch River’s Edge (1986). I was searching for a color project for the class and I was dating a girl who went to college on Long Island, she had to go get something at the mall. Luckily, I had my camera because the mall was a cauldron of color and light. I shot at least a full roll of slide film on that first trip. I started to realize that the mall was kind of the suburban town square. It’s where the people came together, and that it had become the most important civic space. I realized that the pictures that I was drawn to taking were about the way that groups and families existed in the spaces. Were you setting out with a specific intention or exploration in mind? 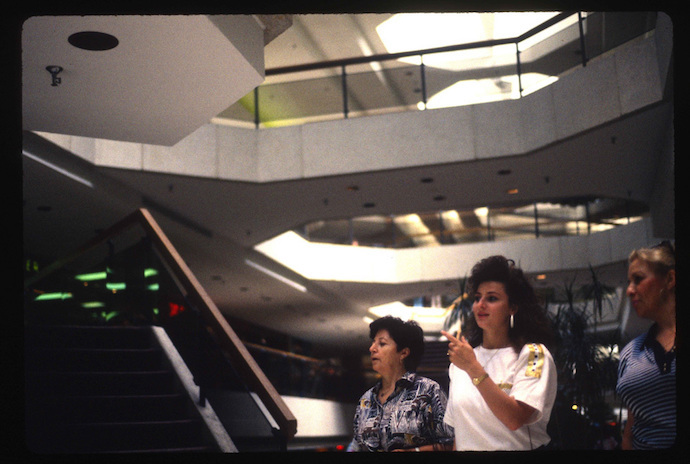 When I first started shooting in the mall on Long Island, I think I was just doing street photography, ala Gerry Winnogrand except inside and in color. However, even after my first few rolls I started to get a sense of the culture of the place. After that I was looking for moments that captured the sense of that time and space. For me it was as much about photography, as it was about sociology or philosophy. I was looking at the mall as a civic space, in the continuum of culture. I was thinking about how the way a space is designed affects the way that people interact, and the constructs, or assumptions, with which they create spaces. This mall in Long Island had big open spaces with windows on high that brought in what you might call Edward Hopper light. The benches and plants gave it the function of a public park or a town square. I loved watching how the teenagers interacted, and the families moved through the space. Some rushed, some strolled, and some just seemed dazed. I was people watching the people watchers. How did the project expand? After starting the project my photo teacher pushed me to expand it. I decided to go across America in the grand tradition of The Americans. 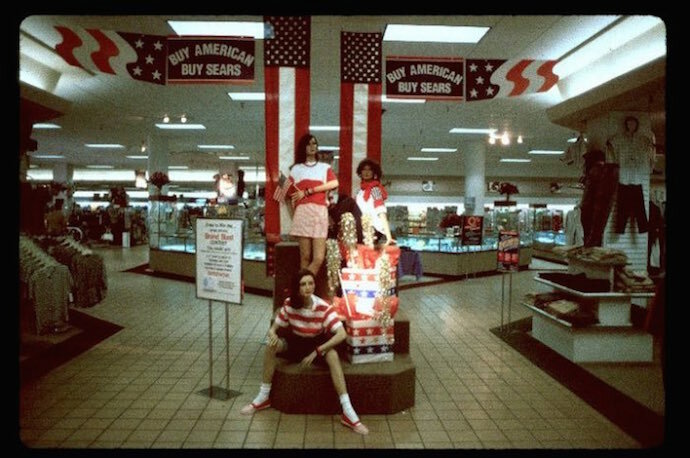 My expectation was that I would get a good sense of what “America” had become by going to the malls. 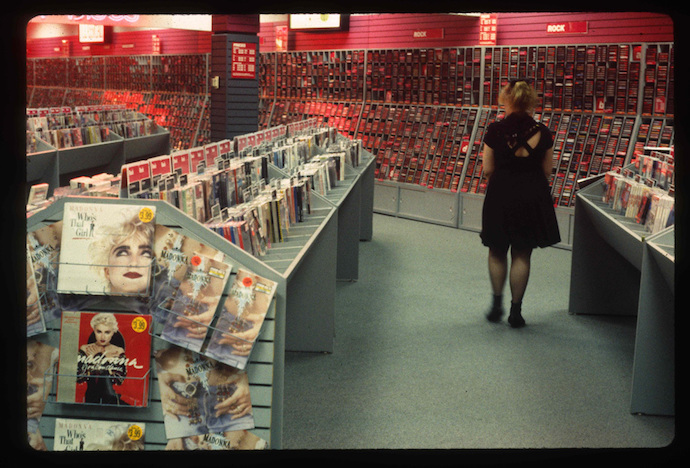 Malls had become a big part of popular culture, but they weren’t too well represented in the arts or media. It seemed like a great way to discover America; our On the Road adventure. I was thinking about The Americans and how that book kind of captured America at a certain place and time where regionalism still had some sway. I wanted to see if that was disappearing, and it really was. I couldn’t tell where I was though the malls in the mid-midwest were a lot less crowded. One mall in Washington State was identical to one in Missouri. They clearly used the same set of plans–that was surreal. How long did you spend in each mall taking photographs? The first body of work was from three or four trips to the mall in Smithtown Long Island. So I probably spent a good ten hours there. The rest of the malls were shot in an hour or two. We didn’t have a map of malls, we just kept our eye out for them or were directed to them by friends we stayed with. We would have likely headed down to Southern California and across the South West, but our car got broken into in San Francisco and we kind of high-tailed it back across the country. This was a time before smart phones and digital cameras being omnipresent. Were you worried about being caught taking people’s photos? I remember being very nervous about being caught taking pictures so I kept a really low profile. I rarely raised my camera to my eye to frame a shot, but instead shot from the hip. 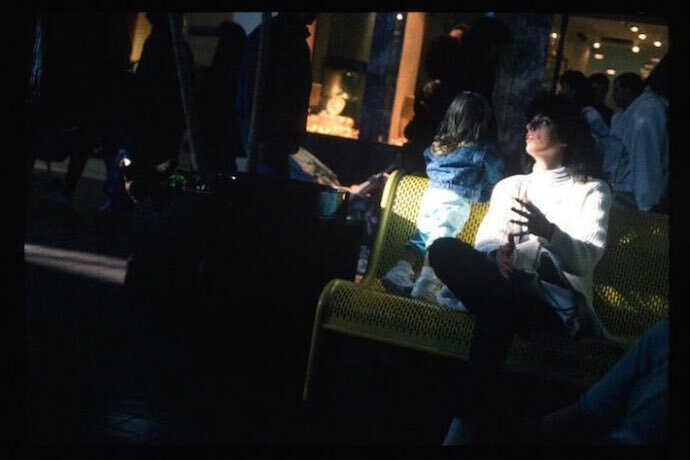 I would find a spot where I would be less noticed and compose shots that would capture people in relation to the space. I think that I also framed some of the wider shots–when it was clear that I wasn’t taking pictures of a specific person. 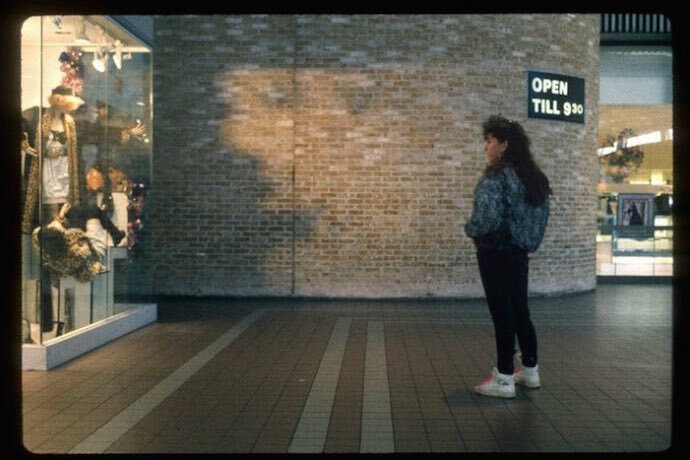 Can we talk those eerie shots that look like they were taken in the evening and the mall was getting dark. Where those all naturally lit, on camera? There are a few that were probably late in the day and like a lot of the images in the Long Island Mall I found a spot and I exposed for the back light and just shot a bunch to see what I’d get. I probably popped off about 15 images and got a few that made it into the book. That’s what it felt like in that spot, the setting sun slammed through those window and it was blinding. You’re capturing the beginnings of grunge the slackers and mall chicks. Obviously you got the whole nostalgia kick with the Orange Julius, Jocks, Double Dragon arcade games and babes. This was a weird time of stasis, punk was dead, college radio bands like The Replacements and R.E.M. weren’t hitting the mainstream and I think “alternative culture” was pretty marginalized. 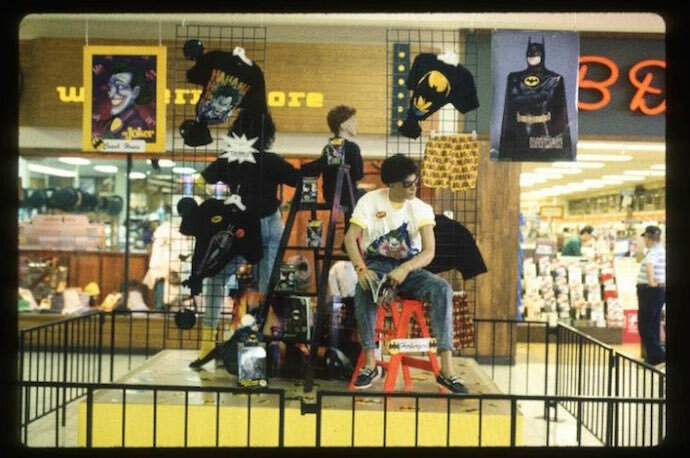 I didn’t see a lot of people in the malls that seemed like they were not a part of the larger mainstream culture – except for a goth here or there. The Mall chicks were kind of post preppy handbook and pre-grunge. 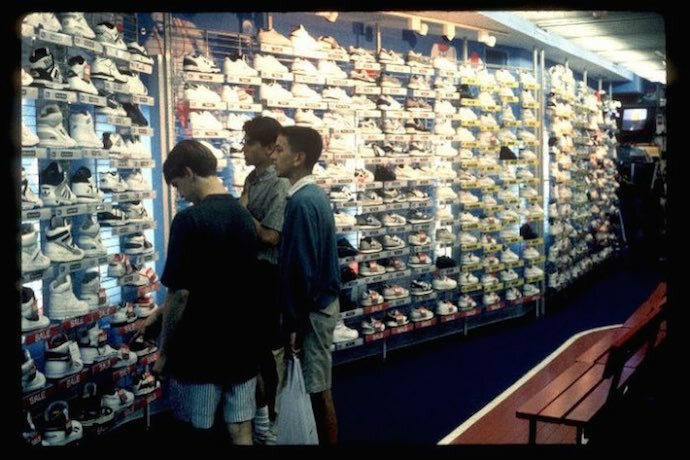 Were you one of those kids who spent their weekends at the mall? I was less of a mall rat than a kid who hung out on main street in our town. That has almost as much to do with the fact that I could easily bike to main street but the mall was a bit harder to get to by bike. I wrote in the foreword though that when I was about eleven, I used to go on big shoplifting expeditions with my sister and her friends. They used me to steal the clothes they wanted because I was so innocent looking. 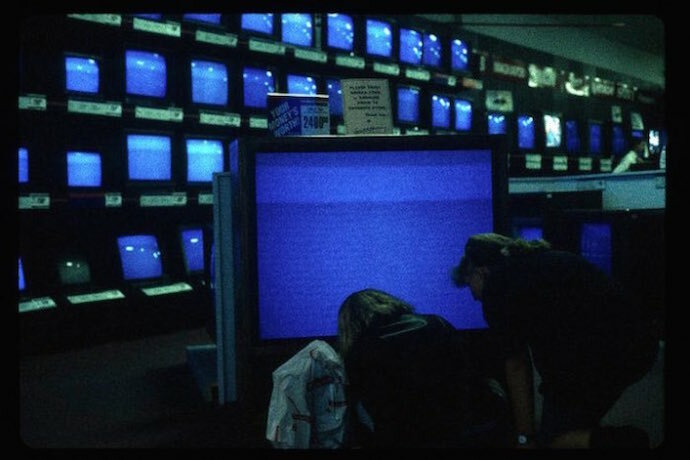 The mall always kind of freaked me out. When I went on the trip I hated malls. I was a very much an outsider but tried not to take pictures like one. There’s a real loneliness to some of pictures like people sitting alone in food courts and on benches. 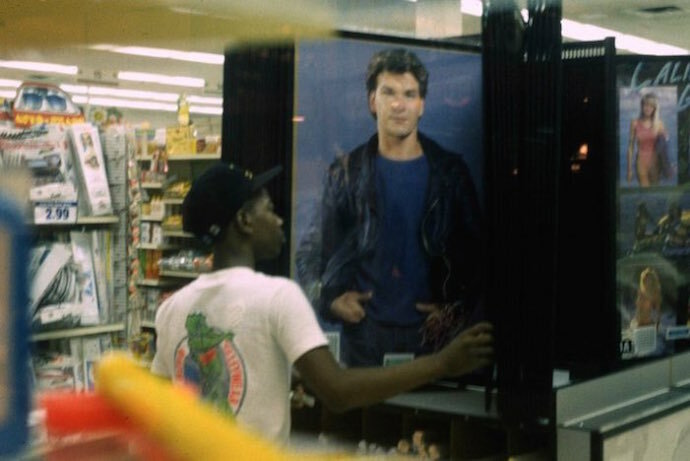 That kind of loneliness in a crowd is something that I noticed a lot of, especially in that mall on Long Island. The mall was packed but there was very little interaction. The hallways were like highways and the park like parts housed a lot of people who’d shopped till they dropped, or who had lost their friends. This was pre-internet, pre cell phone so if someone got separated it wasn’t so easy to find one another. You’ve managed to document the urban sprawl and the paving of the west. At the time you started you were just twenty. How aware were you of the feeling of the American landscape being gentrified at that time? I was twenty, and I was kind of bursting at the seam with ideas, but not much way of doing anything with them. This was pre-internet and pre-tech boom. The world felt a little flat George Bush was President and the Gulf war hadn’t happened yet. I took a few pictures of the outside of the malls, but didn’t use any because for me the idea was almost of being lost in these spaces. The world didn’t seem like it was gentrifying it just seemed to be. The real boom and bust cycle reignited shortly after this trip. That was kind of the period of the grimace before the fart. You said you did a few photo slide shows around the time the photos were taken. Did people respond to it or did it take till now to for the images to fully resonant? In the past couple of years I have been going back through a lot of my work, as a musician, a filmmaker, and as a photographer. I think a lot of it exists in this kind of dry middle space. I was never into work that drew attention to itself, or was too brash. As such, at the time it was made a lot of the things I made didn’t really scream for attention. 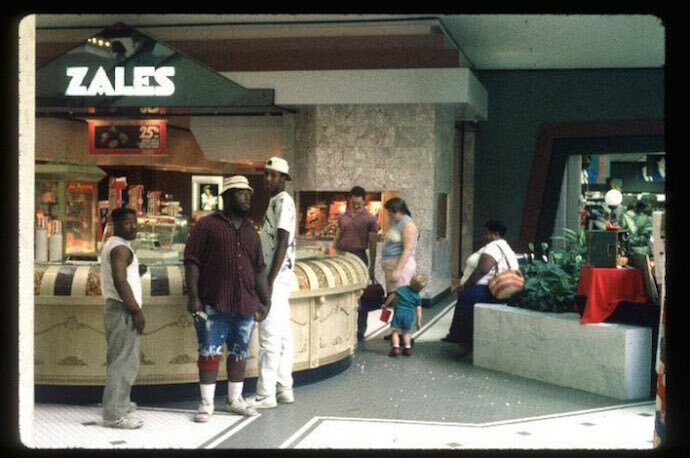 There are a few of the mall pictures that jump out as somewhat humorous, but for the most part they didn’t scream “look at me.” I got them back and went through them and I liked a lot of it. I took a few to some galleries but they didn’t seem at all interested. 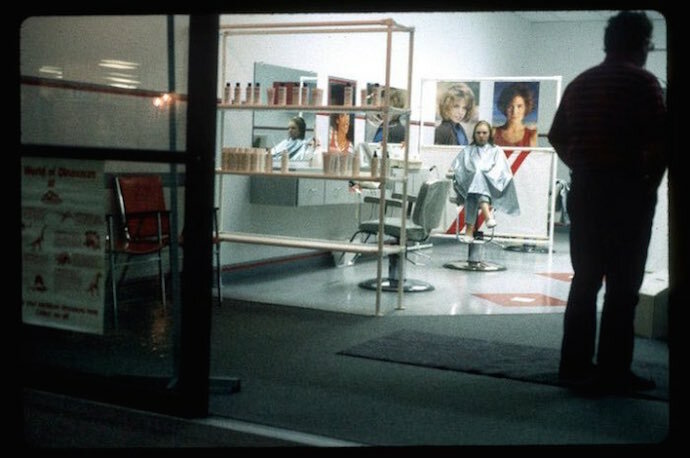 There was a really cool art center called Thread-waxing Space that I showed them at one time during a rock show. They hosted events and I think my band Sleepyhead played with Guided By Voices there and I arranged to project the slides. This was probably 5 years after they were taken and already they had a little bit more resonance because the world had shifted. However, I don’t think they had nearly the resonance they do now. Then I stuck them in a drawer. Fifteen years later I ran across them and decided to scan a few. Then they really resonated. I’ve come to see that twenty years is a pretty good amount of time for work to kind of come into its own. I think that one of the reasons they really took off on fashion blogs based in NY is that so many people who work in the fashion industry grew up on Long Island and went to the mall that started it all.